The who’s who of Gospel, Chicago and much of America came out to celebrate and say goodbye to the Queen of Gospel, Albertina Walker. 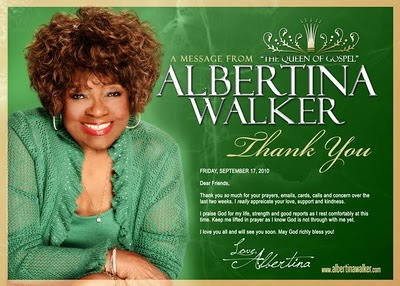 Shirley Caesar, Tramaine Hawkins, Angela Spivey, Bobby Jones, Joe Ligon of The Mighty Clouds of Joy, The Chicago Mass Choir, The Barrett Sisters and many more performed tributes to the late Albertina Walker at her Musical Memorial. Tramaine Hawkins singing "Coming Home" & "Going Up To Yonder"
First Lady of Gospel, Shirley Caesar and The Caravans sang for their mentor at the funeral. Yolanda also delivered a song paying respect to a woman that opened many doors. The Queen of Soul Aretha Franklin topped it off with a performance ’sanging’ “I’ll Fly Away” with much passion. the Queen of Soul Aretha Franklin, Yolanda Adams, Shirley Caesar, Dorothy Norwood, Inez Andrews, Bobby Jones, The Barrett Sisters, Rev. Clay Evans, U.S. Congressmen Jesse Jackson Jr., U.S. Congressmen Bobby Rush, Governor of Illinois Pat Quinn, Illinois State Congressman Rev. James Meeks, Rev. Gordon Humphrey, Calvin Bridges, Tramaine Hawkins, Joe Ligon, Judge Greg Mathis, Jacqueline Jackson, the Chicago Mass Choir, Joshou Troop, Angela Spivey, New Direction, Delores Washington, and thousands of her dedicated fans, friends and family.